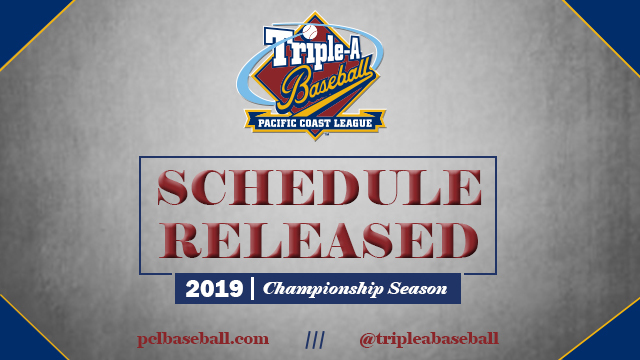 ROUND ROCK, Texas - The Pacific Coast League is excited to kick off its 117th season and today released the official schedule for the 2019 Championship Season. The 16 teams will each play a 140-game schedule that begins on Thursday, April 4 and wraps up on Monday, September 2. The PCL begins a new era in 2019. The San Antonio Missions replace 31-year member and two-time champion Colorado Springs Sky Sox. The Missions, who were in the Double-A Texas League for over 100 years, will be affiliated with the Milwaukee Brewers. Four other clubs - Fresno (Washington), Las Vegas (Oakland), Nashville (Texas) and Round Rock (Houston) - will have new Major League partners. The Washington Nationals organization return to PCL affiliation for the first time since 2006. In 2019, 15 PCL clubs will partake in Minor League Baseball's growing "Copa de la Diversión" initiative. The platform, designed to connect Minor League teams with their diverse communities, will see clubs, for select games, establish culturally relevant on-field personas - such as the Albuquerque Isotopes transforming into the Mariachis de Nuevo México. Of the 72 Minor League clubs participating in 2019, over one-fifth are from the PCL. The 16 clubs are again divided into four, four-team divisions between two conferences - the American and the Pacific. With the addition of San Antonio, the American conference will feature a new look. Iowa, Memphis, Nashville and Omaha will make up the Northern Division, while San Antonio will join Oklahoma City, New Orleans and Round Rock in the Southern Division. Each team will play 112 games within their conference. The regular season slate features the Missions first-ever game under Triple-A classification (April 4 at Oklahoma City), along with their first home contest (April 9 vs. Memphis), and a rematch of the 2018 PCL Championship Series, when Memphis visits Fresno from August 10-13. The 32nd annual Triple-A All-Star Game will be hosted by the PCL's El Paso Chihuahuas on Wednesday, July 10. The All-Star festivities at Southwest University Park begin on July 8 with the Home Run Derby. When the regular season concludes on Labor Day, the playoffs begin two days later, on Wednesday, September 4. The Conference Playoffs feature the winners of the two divisions in each conference. The two teams that advance will meet in the PCL Championship Series, beginning on September 10. All playoff series are in a best-of-five format. The 2019 champion will then meet the International League champion in the National Championship Game on Tuesday, September 17, a one-game, winner-take-all contest.